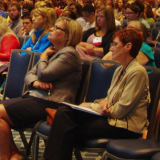 Whether you are developing a research symposium, a professional association conference, a youth program, or a workshop to meet the outreach requirements of a major grant or fulfill the service element of promotion and tenure requirements, Conferences and Institutes can help you achieve your goals. By ensuring that participants enjoy the highest-quality experience possible, we help enhance the profile and prestige of your college, and Penn State overall. If you have an idea for a program, you can begin by sharing your idea with your college’s outreach representative listed below. Any college offering a continuing education program or conference should follow University Policy AD 03. An exception may be requested by completing the AD 03 Exception Form.